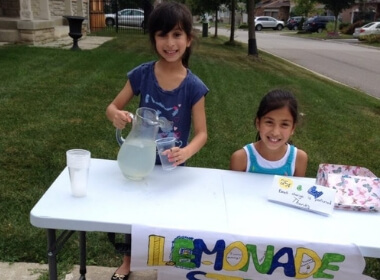 When 6-year-old Sonya and 8-year-old Alysha held their very first lemonade stand, they charged 25 cents for a glass and ending up selling $6.00 worth of lemonade. 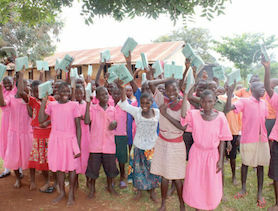 The girls were ecstatic at the money they raised, but Sonya and Alysha knew that instead of keeping the proceeds, they could donate their earnings to help children in need. 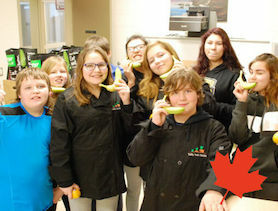 After searching online with their parents for an organization to donate their proceeds, the girls decided to support Canadian Feed The Children. The family liked that Canadian Feed The Children helps children thrive all over the world, including Canada, and they were very impressed by the organization’s financial reporting. Alysha and her sister knew they needed help if they wanted to raise more money, so the girls called upon their neighbourhood friends Isabella and Rachael to join in their fight against hunger. 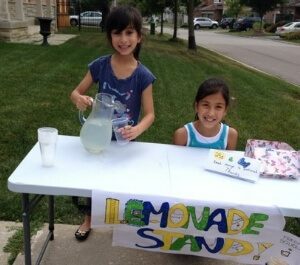 When they set up their next lemonade stand, the four girls raised $27.00 and donated all proceeds to Canadian Feed The Children. Deciding that selling lemonade wasn’t enough, the girls made homemade treats and offered a package to customers with cupcakes, cookies and brownies. In addition, they decided to set up shop in a more central part in the neighbourhood to attract more customers. Sonya, Alysha, Isabella and Rachael even created their own price list for the goodies and posters to advertise not only their baking, but also to show their support of Canadian Feed The Children. Neighbourhood friends Isabella, Alysha, Sonya and Rachael spend every summer together, baking treats and selling lemonade to help children live free from poverty. All of their hard work paid off and the four raised a whopping $226.35. 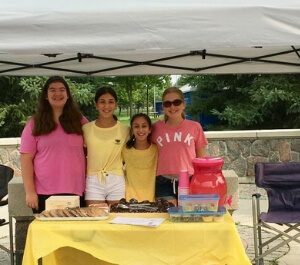 The next summer, the sisters were determined to beat their earnings from the previous year and raised a staggering $317.00 from their lemonade and baked goods stand! These neighbourhood friends spent many beautiful summers together, sharing laughs while baking treats, all to support children around the world. But, the giving doesn’t stop with the summer – Alysha has asked for donations to Canadian Feed The Children in lieu of birthday gifts for the past two birthdays! Thank you Sonya, Alysha, Isabella and Rachael for helping children around the world thrive. Way to go! For many parents, school supplies are unaffordable. Notebooks, textbooks, rulers, pens and pencils ensure a productive and fun school year for students.